VANCOUVER — It was a perfect start for a team that still has a perfect record. 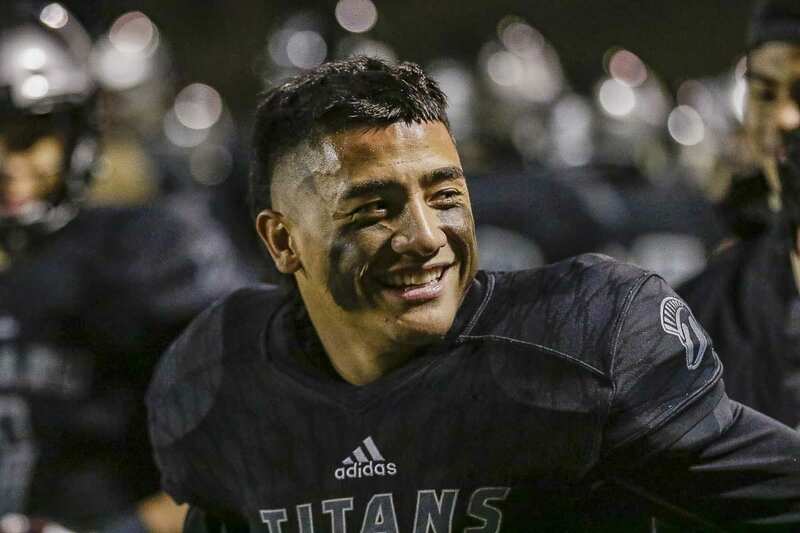 The Union Titans, peaking at the right time according to quarterback Lincoln Victor, scored seven touchdowns on their first seven possessions Friday night en route to a 50-10 victory over Skyline to open the Class 4A state high school football playoffs. Victor had touchdown runs of 66 and 53 yards, and the top-seed Titans put up 528 yards of offense to improve to 11-0. The Titans will host the winner of Chiawana-Bothell next week in the state quarterfinals. Victor finished with 122 yards rushing and 208 yards through the air. The guys up front paved the way for a total of 284 yards rushing. They spread the love around the stat page, too. Nile Jones had two rushing touchdowns. Jojo Siofele had 103 yards from scrimmage. Darien Chase had a 51-yard run to set up one touchdown, then dominated another drive with three catches for 52 yards to set up another score. Alex Vallejo finished with a team-high 76 yards receiving, with a touchdown. Alishawuan Taylor, meanwhile, got the ball once on offense. Naturally, it was a touchdown run. Defenses cannot take away everyone, is the strategy. Union has too many to defend. Oh yes, that game last year. Union won the 4A Greater St. Helens League in 2017 but lost in this, the opening round at state. This year, a repeat as league champions, but a blowout victory in the first round. This is the first season the Washington Interscholastic Activities Association has seeded the playoffs. Union got the No. 1 spot in the bracket. Still, Victor acknowledged he and his teammates have a bit of a chip on their shoulders. From last year’s loss. To all the close victories this season. That would mean three more wins in this playoff run. If the Titans execute the way they did Friday, Victor said a championship is a possibility. Before December, though, the Titans must get past November. The games, the opponents, are surely to get tougher. 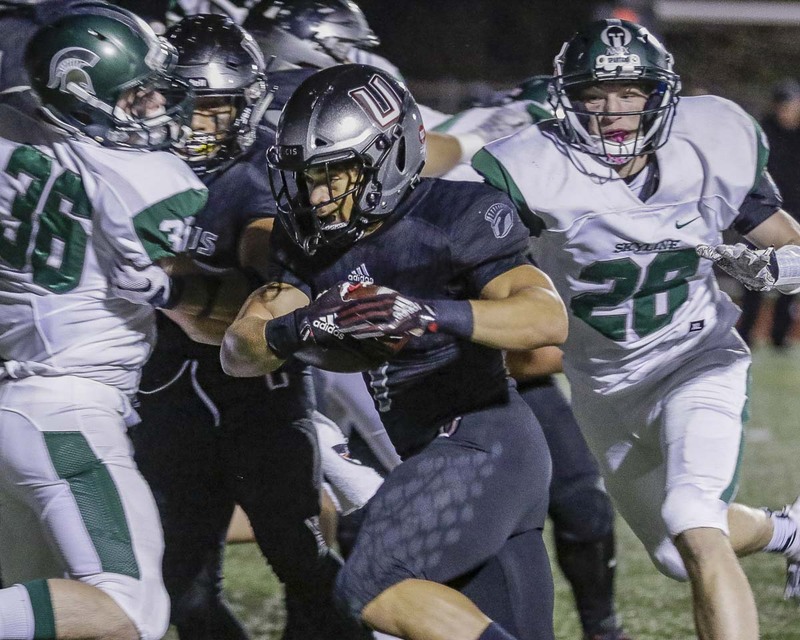 Union coach Rory Rosenbach had to like how his team kept going against Skyline. While Union was scoring at will, the Spartans returned the favor with a first-quarter score. Then the Spartans ended the first half with a field goal to make it a 29-10 game. Skyline would get the ball first in the second half. The Union defense was up to the challenge. A three-and-out, and then a punt. Union scored two minutes later to go up 36-10. Skyline’s last chance to get back in the game came next. 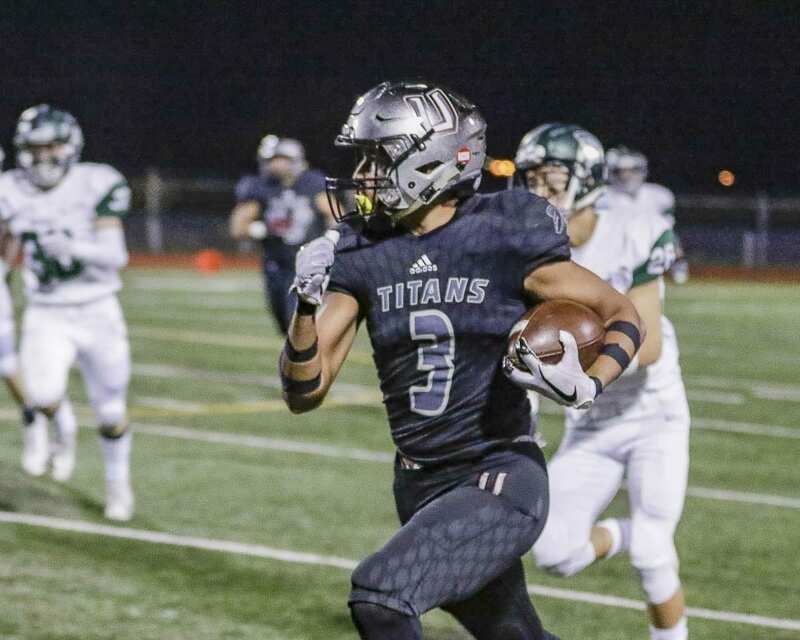 The Spartans would get to the 1-yard line, but linebacker Jack Eggleston got a tackle-for-loss on third down, and an incomplete pass on fourth down gave the ball back to the Titans at the 4-yard line. Six plays and 96 yards later, Union was up 43-10. “We couldn’t let our foot off the throttle,” Victor said. Instead, the Titans revved up the engine some more and made it a running clock — up 40 points — with more than three minutes left in the third quarter. It was another start for the Titans. They started the season with big non-league wins. They got the crucial league victories. They won a playoff game last week. They started state this week. Now, they hoping to finish strong, starting with preparation for the next challenge. RUSHING: Skyline — Beau Switzer 21-46, Green 4-6, Eddie Rosemont 1-(minus 11), Team 1-(minus 17). Union — Siofele 7-37, Darien Chase 1-51, N. Jones 8-9, Isaiah Jones 8-45, Victor 3-122, Taylor 1-6, Aiden Olson 3-7, Lamont Lane 2-6. PASSING: Skyline — Green 16-27-0-179, Rosemont 1-1-0-(minus 1). Union — Victor 12-16-0-208, Bowen 2-2-0-36. RECEIVING: Skyline — Rohleder 3-26, Donovan Bahall 2-15, Cole Good 1-6, Cameron Trencher 4-49, Switzer 2-4, Christopher Johnson 5-78. Union — Siofele 4-66, Chase 5-66, Vallejo 3-76, Tobias Merriweather 2-36. Paul Valencia joins ClarkCountyToday.com after more than two decades of newspaper experience. He became the face of high school sports coverage in Clark County during his 17 years at The Columbian. Before moving to Vancouver, Paul worked at Oregon daily newspapers in Pendleton, Roseburg, and Salem. A graduate of David Douglas High School in Portland, Paul enlisted in the U.S. Army, serving three years as a soldier/journalist. He and his wife Jenny recently celebrated their 20th anniversary. They have a son who has a passion for karate and Minecraft. Paul’s hobbies include: Watching the Raiders play football, reading about the Raiders playing football, and waiting to watch and read about the Raiders playing football.